I recently walked across an entire state. There is something intriguing about walking across a state that you usually drive through on your way to somewhere else. Other than the usual welcome sign at the state line, it’s hard to see anything from the view of my car window as I drive on Interstate Highway 95, that clearly distinguishes Delaware from nearby Pennsylvania, Maryland and New Jersey. The drive is so quick that you can pass right through without even realizing it. Over the past few weeks I have traveled through 19 different states looking for interesting places, people and events to write about and photograph in preparation for the completion of Uncharted’s new online exploration community. So when I heard about the Wilmington Trail Club’s annual Hike Across Delaware, I thought it would be a great chance to explore a state much closer to home. The event, held each year in November, begins at Battery Park in Delaware City near the Delaware River, just across from New Jersey, where hikers board buses for a short ride to the Maryland-Delaware state line near Chesapeake City, Md. They then walk 14 miles (22.4 kilometers) all the way back to Battery Park. I do a lot of hiking for Uncharted. Once I hiked for several hours at night in sub-zero temperatures on snow-covered trails in the Rocky Mountains for a story. I have spent considerable time exploring all kinds of trails, caves and forests, each time lugging camera equipment and other supplies most hikers don’t ordinarily have to deal with. It’s always tempting to leave some of it behind. On my way to Delaware City at a ridiculously early hour of the morning, I keep telling myself that carrying my equipment across a mostly flat state wouldn’t be so bad. It’s usually in those early hours that I’m at my weakest, when the idea of leaving some equipment behind or taking a shortcut is most tempting. But by the time I reach Delaware City I’m ready to hike across the state carrying two cameras, three lenses, battery packs, a flash, lunch and some other supplies. As the buses drive away, 250 hikers begin the journey from the Maryland-Delaware state line all the way back to Battery Park. At first, everyone is packed together with hardly any room to move, but soon the group splinters into smaller pieces moving at varied paces until they are so far apart that you almost feel as though you have the whole trail to yourself. I don’t get very far before I’m reminded of the rewards for hauling my gear and making the complete journey on foot. Most of the trail follows the Chesapeake and Delaware Canal which is not only a unique setting for a hike, but is also a great place for boating, fishing and viewing waterfowl. I hike for several miles passing under the occasional highway bridge some several hundred feet above, where travelers drive unaware of the trail below. They’re missing out. Autumn foliage, the transformation from green to hues of yellow, orange and red reflects in the canal as Wooly Bear Caterpillars, with matching orange and black coats, inch across the trail, the shadows of hikers’s feet threatening to squash them into the ground. By the time I reach the halfway point, I’m feeling the weight of those cameras, their straps digging into my shoulders. My shoes feel like they’re filled with cement and each step seems heavier than the one before. But it’s all worth it. A formation of more than a dozen hawks appear overhead soaring in circular patterns in search of their next meal. That extra lens suddenly seems lighter as I raise it upward to capture the moment. Eventually, our course takes us away from the canal into wetland trails for the final stretch of the hike, passing through some residential backyards into Delaware City and finally back to Battery Park. 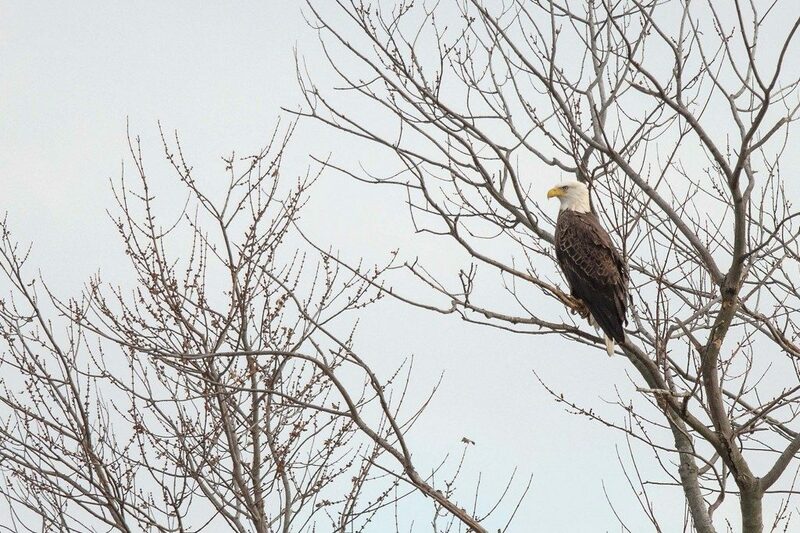 As I walk toward the finish at the shore of the Delaware River, a hiker notices my cameras and tells me that there is an American Bald Eagle on a tree not far from where I stand. I hurry onto a nearby dock just in time to catch it proudly perched on a branch moments before it flies away. I’ve been to Delaware many times, hurriedly driving from one side to the other on my way to somewhere else. I could drive back and forth all day and never really see anything, but in five hours I walked across it and discovered Delaware for the very first time. Alan Murray is Uncharted’s President and one of its co-founders. To learn more about Uncharted, sign up today and we’ll let you know when our new online exploration community is ready.